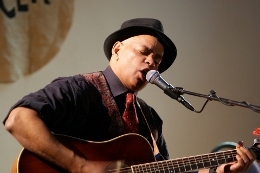 The closest you’ll find to a modern-day troubadour, acoustic bluesman Guy Davis is back with another terrific collection of tunes on his second release for M.C. Records, Kokomo Kidd. From the plucky, tuba-accented title track about a country bootlegger-turned-political fixer on which Davis raps about a life working for Washington insiders – what Davis describes as “sort of a demented celebration of corruption” – with such lyrics as “you’ve got to know the ropes and who to go to, who did you favors and who do you owe to/ now office to office, I can hack your email, find out if you like male or female” and “I got a meeting at 3, I gotta’ bring coke to the GOP”, to other uptempo, breezy songs such as “Like Sonny Did” (dedicated to the late harmonica player Sonny Terry, about whom Davis says “It took me 20 years to steal from him what I know so far”) and several old-time blues numbers, to soft, tender ballads like “Maybe I’ll Go”, “Taking Just a Little Bit of Time”, and the lovely, Pete Seeger-inspired “Wish I Hadn’t Stayed Away So Long”, Kokomo Kidd has pretty much everything you can ask for, all accented by Davis’ sandpapery voice and an impressive range of sounds. You’d have to be missing a pulse for your spirits not to be lifted by Davis, whether through the lively music he creates – on instruments that here include the acoustic six- and twelve-string guitar, banjo, harmonica, keyboards, and percussion – or the lyrics he delivers, ranging from the humorous (“yes, I tried to keep them separate, but that didn’t work at all/ one lives around the corner, the other one just across the hall” on “Have You Ever Loved Two Women (But Couldn’t Make Up Your Mind? )” and “you can besame mucho, when I’m standin’ at your window/ you can kiss me like a gaucho, when I’m layin’ on your coucho/ come on, honey, well, there’s all night long/ kiss me, mama, well, there’s all night long” on “Blackberry Kisses”) to the sensitive (“My mother died when I was on the road/ bell rang on the midnight train, carrying the hobos home… I got home too late to say goodbye” on “Wish I Hadn’t Stayed Away So Long” and “I like to go by the river, and sit on the banks all day/ with a pole & line and nothing on my mind, I can hear what the catfish say” on “Taking Just a Little Bit of Time”). A brilliant storyteller, Davis is full of surprises, including the addition of some, well, stinging guitar on the otherwise rather simple country blues of “Bumblebee Blues” (Bumble Bee Slim), a reggaeish twist on Donovan’s “Wear Your Love Like Heaven” that far surpasses the original, and a fine cover of Bob Dylan’s “Lay Lady Lay”, to mention just a few. Harmonica ace Charlie Musselwhite joins Davis for a creeping version of “Little Red Rooster”, which also features some terrific guitar and tinkling of the ivories, with the creeping continuing – this time accompanied by some delightful mandolin from Chris James – on “Cool Drink of Water” (Tommy Johnson), making for a nice contrast to songs like the light, airy “Blackberry Kisses”. 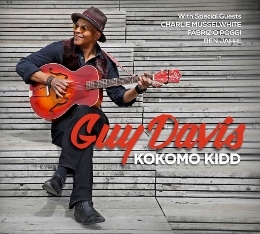 Truth be told, there just aren’t many who can deliver Americana in as interesting and entertaining a manner – or give acoustic traditional blues such a contemporary sound – as Davis, and it sure is a lot of fun hearing him explore the different sides of the genre here on Kokomo Kidd. This entry was posted in Albums and tagged Charlie Musselwhite, Guy Davis, Sonny Terry. Bookmark the permalink.